Notice how the prophet Isaiah repeatedly affirms Who this LORD is … among the many statements in these chapters 40-45 of Isaiah. Who is this God Isaiah claims to speak for? His answer gives us a clue of how to discover Him by examining His works. Further affirmation of God’s identity and power is Isaiah 42:5-7. And don’t miss verse 8. Strengthening the message even more, God speaks to us through His prophet further in Isaiah 43:10-11. I’m reminded why Paul exhorts Christ’s reborn sons and daughters to engage in “our warfare” and “cast down imaginations and every high thing that exalts itself against the knowledge of God… bringing into captivity every thought to the obedience of Christ (2 Co. 10:4-5). You’ve heard the reports… new so-called ‘discoveries’ point to naturalism – to evolutionary processes – to explain that the Creator wasn’t necessary. Maybe because water molecules are detected on Mars, life could have evolved there. Science has only demonstrated that life can’t evolve here on earth. What makes anyone think that it could evolve out in space? Answer: “vain imaginations” (Ro. 1:21) by those who refuse to “retain God in their knowledge” (Ro. 1:28). Reading Romans chapter one helps us understand the harsh warning of Hosea 4:6. Did you know Charles Darwin pronounced a challenge for modern science to prove him wrong? In other words, if you can find just one example of a complex creature or organ or system in nature that could not have evolved by natural processes, then the entire evolutionary ‘house of cards’ collapses… the make-believe billions of years vanishes as a masquerade. All the bogus explanations of nature-worshipping textbooks that have to be grossly revised every few years because of new discoveries… eradicated… gone. All because they refuse to listen to God. 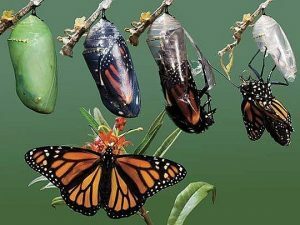 The female butterfly lays her egg in just the right place where the tiny new-hatched caterpillar begins immediately feasting on the special leaves that provide just the right nutrition for a few days as it grows and grows. Then it stops eating and growing to make a thread to hang itself from a branch as it transforms into a chrysalis, a virtual straight-jacket tomb, where it proceeds to dissolve into a formless soup. In just a few more days the soup constructs itself into a marvelous flying creature with totally new systems of life. Emerging in only a few minutes when the process is complete, it inflates its spectacular wings with the bio-chemistry to serve new muscles, joints and support structures and flies away to continue the cycle to the next generation. Contrary to what die-hard naturalistic evolutionists insist their students accept by blind faith, there have never been any fossils showing the evolution of this remarkable system. They find fossils of butterflies but they are all as perfectly complete as the ones flying the skies today. Eyes are wondrous organs. Fossils of various creatures drowned and buried in the Deluge show completely modern and complex eyes. There is no evolutionary process that has ever been suggested to form the eye in step by step fashion. Evolutionists claim we evolved from fish. Fish living in water don’t need tears. If a fish came out of the water it would quickly become blind for lack of tears. 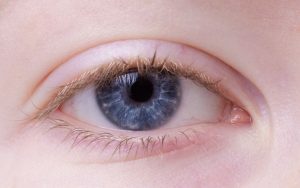 We depend on eyelids to help clean and protect our eyes. Fish don’t have those either. Our tears contain specific antimicrobial chemical compounds that are needed to neutralize microscopic pathogens. Our healthy eyes wouldn’t last a day without these well-designed specifications. How could tear ducts suddenly appear and evolve with all the capabilities of producing these chemicals?